Saranac's #Spiceawar Burger will forever be one of my personal favorite burgers. Not only because it was named after our illustrious spicy food contest, but man, the flavor punch it packed. Awesome. 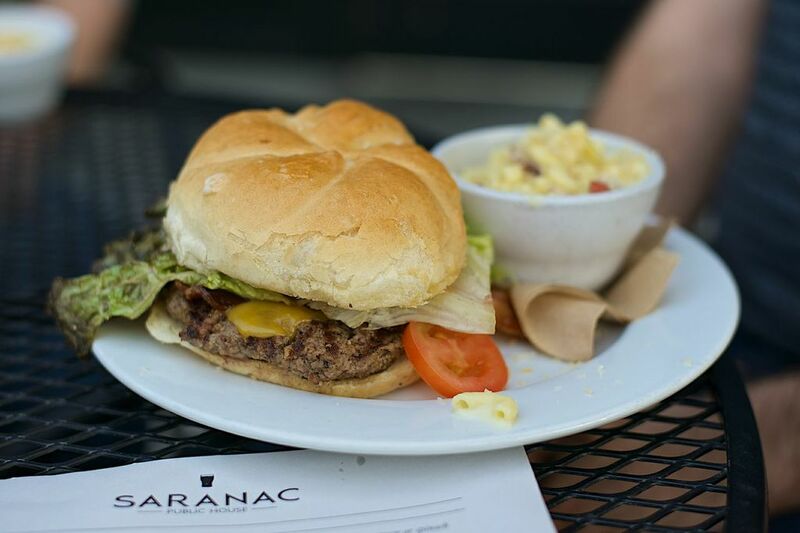 Now, the regular Saranac burger is nothing to scoff at either: Esteemed panelist Patrick O'Halloran (you know him from the aforementioned #Spicewar) described it as an upscale backyard barbecue burger, and I think that's appropriate. There is nothing insanely fancy here, and we are just fine with that. Cheddar, bacon, mayo, and greens? Nice and simple. The bacon in particular added a good kick to the palate. Not only was it flavorful; it also had that proper bite to it. Not too chewy, not too crispy. Tillamook Cheddar is always a good choice, and here they used just the proper amount of it. Some places go too heavy on the cheese, but Saranac made it the supporting character actor it was born to play. The lettuce might have been a bit wilted, but not in a slimy manner. We didn't need to pull it off, so it passed by an inch. One point of debate for the panel was the patties themselves. They were perfectly cooked to order -- two medium-rares, one medium -- but were they flavorful enough? Our photographer found his patty lacking proper seasoning, something I cannot entirely agree with. Maybe he's just too sensitive of an artist? Either way, try and judge for yourself. Finally, the bun stood the Franz's Comparison Test, no problem. Both flavorful and holdable (hey, that's important! ), it clocked in at a higher standard than most we've seen in this great chase. … with the top three standing a good step above the rest. Technically Saranac's burger is in the middle of the list, but as the burgers keep coming in, it will be hard to knock it down much further. It's a great burger. Do you recommend Saranac? Make your voice heard!